2014 KTM Freeride E. Picture credits - KTM. Submit more pictures. 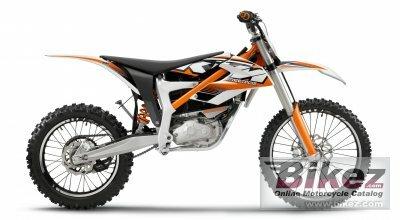 A disc armature design of brushless synchronous motor powers the KTM Freeride E. This low-wear, compact and slim power plant generates 42 Nm of torque from the first twist of the grip and ensures even power delivery. Designed for peak power of 22 kW (30 hp), the electric motor can supply 7.5 kW (10.1 hp) continuously. Twist and go. No clutch. No shifting: Simply twist the grip, ride off and have fun! Ask questions Join the 14 KTM Freeride E discussion group or the general KTM discussion group.